I had the pleasure of receiving the Fairies cookbook from Barbara Beery at Batter Up Kids to review. This book has so many cute recipes in it! They are easy to make and what we tried out ended up being really delicious as well. My 6 year old daughter had as much fun as I did flipping through the book and picking out recipes that she wants to try. Her and I are going to plan a Fairy Princess Tea Party with her little girlfriends one of these days. To get my 2 boys on board for trying some of these adorable recipes we decided to cook up some fairy friendly food on Saint Patricks Day in hopes of trying to entice some leprechauns to make an appearance. We chose Unicorn Calzones with a side of Fruity Magic Wands. Assorted furits such as elons, pineapples, apples, grapes, strawberries and starfruit and 8 wooden skewers. Slice melons, pineapple, apples and starfruit into one inch thick slices. The grapes and strawberries are already bite size. Thread fruits on wooden skewers to make kabobs. 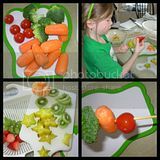 My kids are big fruit eaters so I used this opportunity to use some favorites such as strawberries and grapes and use it as an opportunity to introduce something new such as the star fruit. We also made a veggie version using broccoli, tomatoes and carrots. 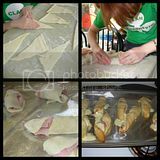 Unroll each crescent roll on a lightly floured work area. Turn to coat each side of roll. Put 1/2 teaspoon of softened butter on each piece of dough, top with 1 slice of ham or turkey, and finish with 2 small chunks of string cheese. Roll up dough from the widest side and form into a straight horn shape. Place each horn 2 inches apart on a foil-lined cookie sheet sprayed with nonstick cooking spray. Sprinkle poppy seeds on top, if using. Bake 12-15 minutes until golden brown and puffy. Remove from oven, cool 5 minutes and serve. Good hot from the oven or at room temperature. I could not get the rolls to roll up right and they looked nothing like the picture in the book BUT that didn't stop them from tasting absolutely delicious! ALL 3 Kids rated this whole meal 5 spoons! The hubs and I gave is 5 spoons too. It was yummy and anything the kids scoff up and go for seconds on will see a return on our table. Want to see what we cooked up for dessert? Vist me over at my blog Life in the BAT Cave. I'll tell you one thing.....mmmmmmm.